If it hadn’t turned out to be such a good radio tower, the Eiffel Tower, “la Tour Eiffel” might have been dismantled in 1909. The City of Paris planned to tear it down, but it was too valuable for communications purposes, and was allowed to remain. And though the tower was heavily criticized early on, it was starting to take on an iconic status, and grow on people, both Parisians and visitors. Today, it is considered the Number One attraction in Europe, and is the top paid attraction in the world, with nearly 7 million visitors a year. Even today, countless people go to Paris, determined not to like the Eiffel Tower due to the lines, or believing it a cliché, or annoyed with the young couples who are always getting engaged there. But then they look out at Paris from the third platform and are totally won over. It’s simply a must-see attraction if you visit anywhere near Paris. 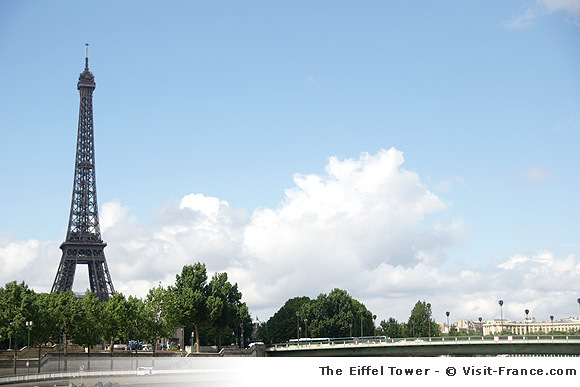 Named after its designer, Gustave Eiffel, the tower is 324 m high (including the TV antenna) give or take. The 7,300 tonnes of iron that are held together with 2.5 million rivets, expand during warm weather and contract when it’s cold out, causing the actual height to vary a bit. The public can visit three levels. To take the elevators in the east, west, or north pillars on their curved trajectory to the first platform costs just €4.80. If you want to go to the second platform, at 115 m high, it will cost €7.80, and if you want to go to the third platform at 276 m, you’ll pay €12. Children under 11 pay €2.50, €4.30, or €6.70 for each of the three levels. Those who don’t mind taking the stairs can go as far as the second platform (115 m) for €4 (under 25) or €3.10 (over 25). While you’re there, you can grab sandwiches and other snacks for under 10 euros at the three “Buffets” on the ground floor, first and second levels. The restaurant 58 Tour Eiffel on the tower’s first level serves prix-fixe meals of around €70-80 per person and is more formal than a “jeans and t-shirt” restaurant. Le Jules Vernes Restaurant is on the tower’s second level and is a one-star Michelin restaurant that is dressy, expensive, and booked solid most of the time. You may have to book several weeks in advance to dine here. La Tour Eiffel really is one of those structures you can’t miss from lots of vantage points in the city. After the Paris Millennium Celebration, Paris chose to continue with the searchlights and the flashing lights on the tower at night. Every hour on the hour after dark, 20,000 sparkly flash bulbs light up the tower in a magical display. It’s on the Champs de Mars in the 7th arrondissement, and you can get off the Metro at Bir Hakeim or Trocadero on Line 6, or on Ecole Militaire on Line 8. Buses 42, 69, 72, 82, and 87 will take you there, and if you’re coming in on the RER it’s on Line C at the Champs de Mars-Tour Eiffel station. The closest taxi stations are Quai Branly and Pilier West.